Why does acorn squash seem so intimidating? The bulbous gourd is actually quite easy to prepare. A recent recipe from Mario Batali in Everyday Food Magazine inspired us to pick up an acorn squash at the Sunday farm market and give it a go. Turns out, squash is squash is squash, for the most part. In fact, New York magazine published a primer on the more unusual varieties. When trying any new veggie, we like to take the path of least resistance and have found that roasting often yields the most desirable flavors. 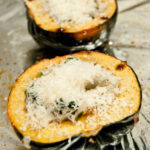 For this modified stuffed acorn squash recipe – we call it “kitchen sink acorn squash” because you can toss in almost any odds and ends veggie in the hydrator – you start by heating the oven to 425 and lining a baking sheet with foil. Drizzle oil on the foil and sprinkle a little salt. Run the acorn squash under the tap to clean off any remaining dirt, and then on a cutting board, slice a bit off of the bottom so the squash is flat and then halve the gourd lengthwise. Scoop out the guts and then place each half on the baking sheet, skin side down. Drizzle the raw flesh with oil and sprinkle with salt. And pepper, too, if that’s your thing. Bake until fork-tender, about 40 minutes. While the squash gets squishy, heat a pot on medium and add oil. Olive or canola will do. Add diced onion and cook until translucent, about 5 minutes. Then add your diced garlic. By now, the kitchen smells pretty good. But why stop here? Add baby spinach – or perhaps kale or Swiss chard – cover, and cook to soften the veggies. Mix it up by adding other diced veggies – such as carrots – with the onions. Once all the veggies are soft, remove from heat. 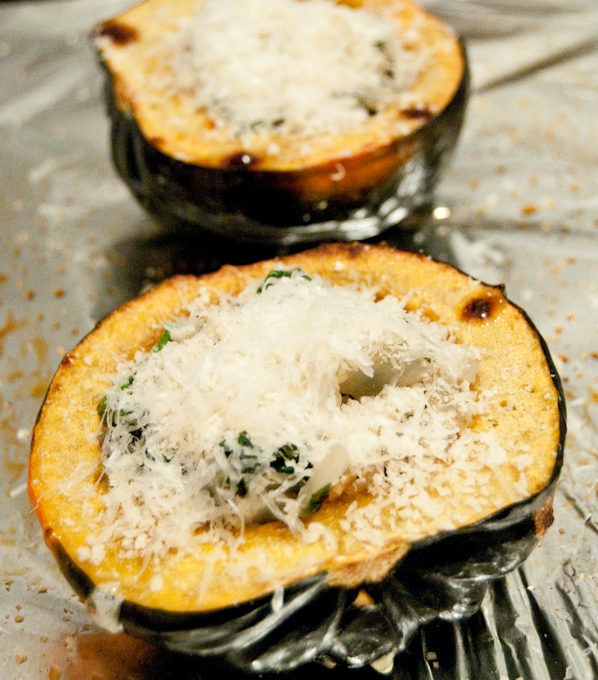 Remove the tender squash from the oven and turn on the broiler. Spoon the veggie mix into each half of the squash. Top with a good sprinkling of panko breadcrumbs, a dash of salt and shaved Parmesan cheese. Broil for about 2 minutes and serve. 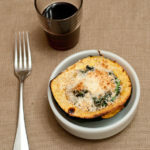 Since squash is mild, the additions of other vegetables, herbs, cheeses, or other toppings make this a versatile recipe. A great addition to a Meatless Monday meal, or a new twist on a veggie side, add this to your fall collection.